Recently I did a guided fly fishing trip with Jan. You might recognise Jan from another post about the Cliffs of Moher in Ireland. There, we unsuccessfully tried to fish for trout in the Lough Corrib. But this time, it was a home game. 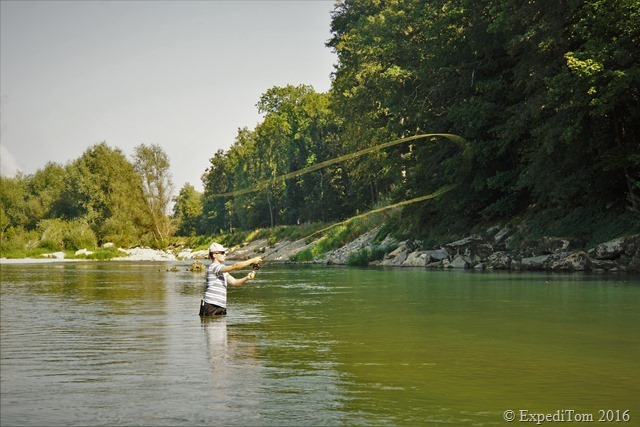 Jan and I met in the early afternoon and decided to head to the Aare instead of a small Jura mountain creek due to the high temperature in September which stresses the fish already enough. A short drive later we arrived at the spot where I had caught some chubs a few days earlier. 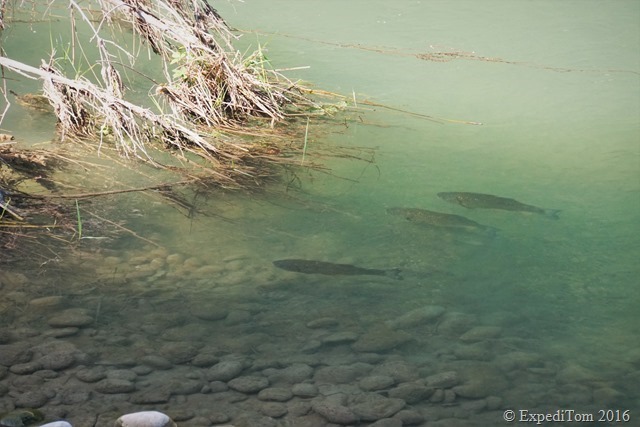 A quick look at some fishy looking spots revealed that the chubs were still there. However, owing to the fact that it was Jan’s very first day fly fishing, an instruction was mandatory. 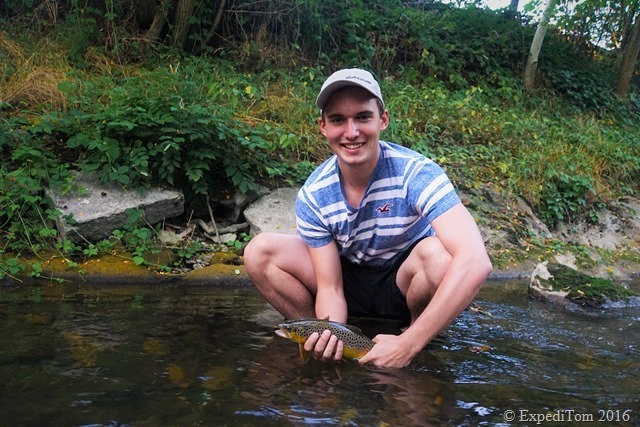 Therefore, we headed 50 metres downstream from the fish and began with the basic casting. As soon as the loops consistently began to improve, we headed upstream to the chubs. We used a wool indicator-nymph rig, which lead to success the last time. Whereas I stood on the higher bank and sighted the fish, Jan casted from the riverbank a few metres below the spot of the fish. After several casts at the 3 huge chubs you see in the picture above, they disappeared into the deeper water. However, now and then they turned up again and had a look at our indicator. A while later, we realised that Jan fished without a nymph. He must have lost it while casting. I changed the fly and did some casts too. A hesitant bite which I messed up, was the only action at this spot. I suppose the chub bit on the red thread which was hanging from the almost destroyed fly. Once more, the chubs had shown how spooky fellows they are. Thus, we headed further upstream to some other likely spots. 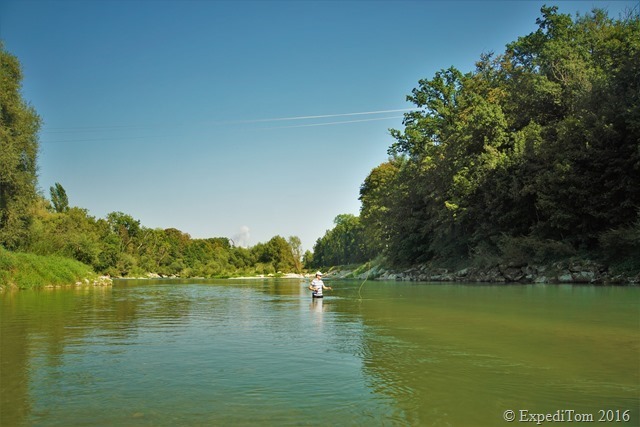 In this area the Aare river was brought to its former state by doing an ecological restoration. The river runs wide and has a lot of structure. This improvement is not only appreciated by the wildlife, but also by heaps of people who are looking for an escape from their sedentary lifestyle. Unfortunately, some guys still do not respect the environment and litter is a common annoyance while fly fishing in such a gorgeous river. While the first attempt of the guided fly fishing trip with Jan was not marked by success we pushed further upstream. A nice deep long riffle looked promising for a trout or even a grayling. Nonetheless, neither of us had a bite. Keeping in mind it was Jan’s very first day fly fishing, he did a great job at casting a fly rod. Although, I had to remind him from time to time to do a pause between forward and backward stroke to avoid the supersonic bang which indicated another loss of a fly. After having fished several promising looking spots, we both did not have any bites. I supposed this might be due to the high temperature which in the afternoon was at its peak. Subsequently, we decided to head to another river which runs colder water. But not before we had a quick swim downstream. Being on a guided fly fishing trip with Jan, I felt urged to hook him up with at least one fish. However, this was way more difficult than expected. Therefore, we headed to some secret spots I had fished several times successfully before. Arriving there, Jan decided to take his spinning rod with him, if we do not catch a fish on a fly. We approached carefully from at least 50 metres below and sneaked up with quiet steps. Jan made the first cast. The nymph drifted through the pool. No bite. This was repeated over and over. Until suddenly the indicator disappeared and emerged again. Was it a stone? Jan was not sure, but it might have been a trout either. However, Jan decided to switch to his spinning rod. He casted his spinner bait across the pool. Then reeled the line in. No bite. This was repeated a few times. 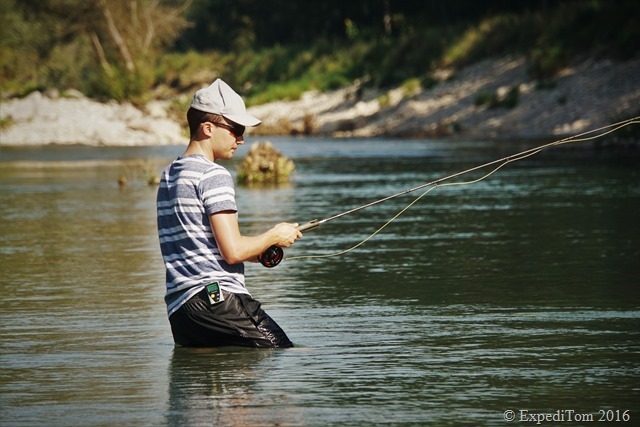 While he was still casting the spinning rod, I realised that the river seemed higher than usual, although there was no rain. Thus, I did some adjustments at the depth where the nymph was running. Jan had already called it a day, but I gave it another try. The nymph landed at the head of the pool, swung through it, and all of a sudden the indicator sunk like a stone. I set the hook and gave Jan the rod. 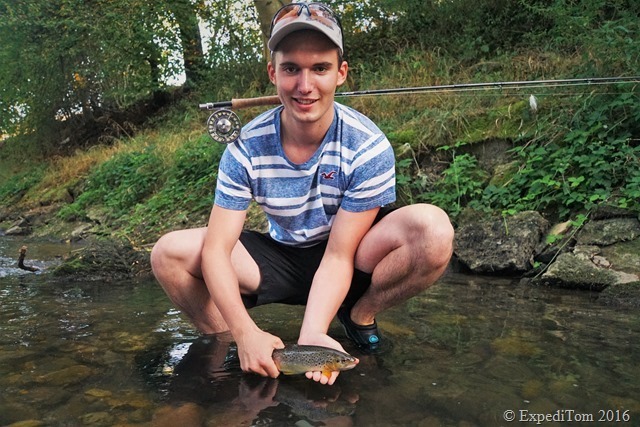 A short drill later, we successfully landed a stunning wild brown trout. Neither of us wanted to stop fishing. The next few cast were ignored until the nymph floated close to the other edge of the pool. This one I landed myself. Then, it was Jan’s turn. He had some issues with spotting the indicator. So I advised him to feel the line with his index finger and if he did not see the indicator he should have a look for the end of the fly line. If it stops or moves the wrong way, lift the rod gently, because it might only be a stone. A few casts later the wool indicator sunk. I shouted “STRIKE!” and Jan carefully set the hook. A few jumps of the trout later, he managed to land his very first fish, which he had hooked with a fly rod all by himself. Jan and I had a great late season fly fishing afternoon with a lot of action. 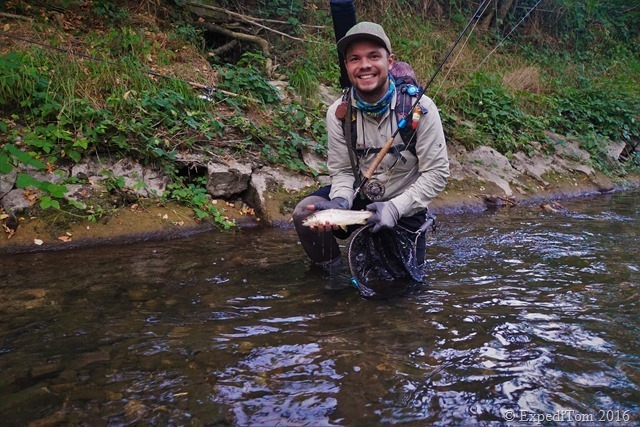 It was amazing to see in this particular case the advantages of fly fishing in comparison to spin fishing. However, this might not be transferred to other situations. Furthermore, the takeaways from this trip are that it is advisable to enter a river far below the fishing spot and even without seeing the indicator you can recognise bites by feeling the line or focusing on the end of the fly line. Thanks Jan for this trip with plenty of laughs.